It can be a scary situation when a student experiences an allergic reaction in a dining hall, for both the student and foodservice staff. But as students become more open to discussing food allergies, universities are beginning to take a proactive approach to addressing students’ dietary needs by creating allergen-free stations to prevent cross-contamination. In fall 2013, the University of New Hampshire (UNH) in Durham, N.H., created a station where the most common allergens—peanuts, tree nuts, soy, milk, eggs, fish, shellfish and wheat—are banned. 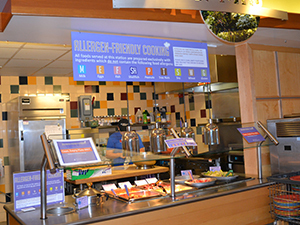 The stand-alone station gives students with food allergies the option of not having to order their meals ahead of time, says Rochelle L’Italien, R.D., the university’s nutritionist. To prevent cross-contamination, students bring a clean, empty plate to the station and are served by staff members, she says. UNH also fosters communication about food allergies among students and staff. L’Italien encourages students with food allergies—and their parents—to talk with her about their dietary concerns. “We have all of our ingredient information posted on our web menus, but we also work with [students] on what is individually needed,” she says. The university’s entire foodservice staff also is trained to prevent cross-contamination and to pick up on symptoms of an allergic reaction. When a student says that he or she doesn’t feel well, the staff are instructed to sit the student down and call emergency services, says Jon Plodzik, director of dining hall operations at UNH. Even foodservice contractors are heeding students’ concerns about food allergens. For example, Sodexo, has developed an allergen-free program for its clients called Simple Servings. The University of Albany, in Albany, N.Y., operates four Simple Servings stations on campus. Each location is in the front of the dining facility to reduce cross-contamination, says Donna Duffy, R.D., the university’s dietitian. Students who visit Simple Servings use square plates and bowls that are designated to the station to further reduce the risk of cross-contamination. If a student walks up with a plate from another station, they are told to take a clean plate, Duffy says. The University of Idaho, in Moscow, Idaho introduced a Simple Servings station in 2013 and uses color-coded utensils to keep cross-contamination at bay. The area also uses separate cutting boards, and staff serves students on designated plates. When it comes to menu items, Pat Clelland, general manager for Sodexo at the University of Idaho, likes to offer a variation of what is available elsewhere in the servery. For example, if the main entree is barbecued chicken, Clelland will offer seasoned grilled chicken at Simple Servings.